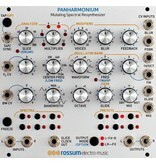 Rossum Electro-Music Software Architect Bob Bliss created Panharmonium, a unique music and sound design tool that analyzes the spectral content of any audio signal and uses that analysis to drive a bank of from 1 to 33 oscillators. Depending on various control settings, Panharmonium can accurately reproduce the input spectrum in real time or modify it in a multitude of wildly creative ways. All with an interface whose immediacy encourages performance and interaction. 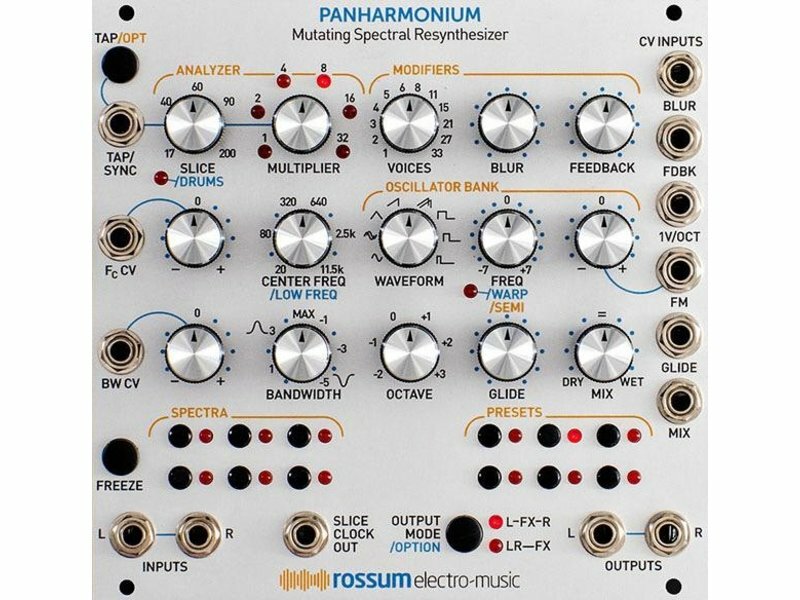 Panharmonium's input can be anything from a single oscillator to an entire mix (including vocals). From dense, swirling pads and drones that evolve with the input’s changing spectrum, to clock-syncable spectral arpeggiation, to as-yet unnamed harmonic effects, it opens up an entirely new world of sonic possibilities. 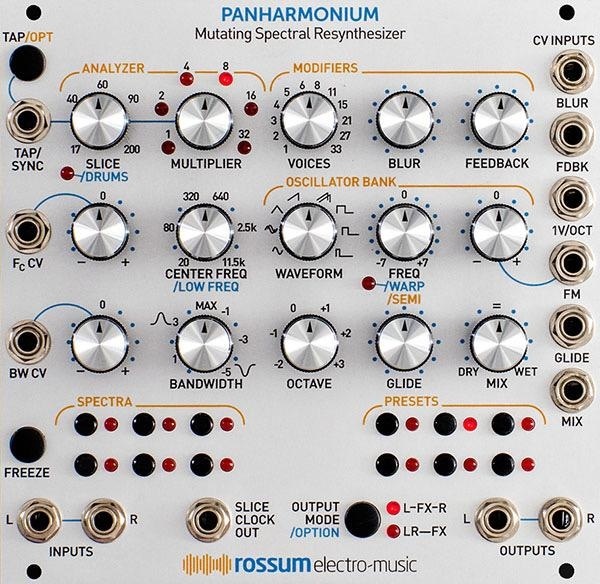 Additionally, the module can take a snapshot of an instantaneous spectrum and use that as a complex harmonic oscillator, which can then be modified and modulated by all of Panharmonium’s other controls. • The Slice parameter sets the rate at which the incoming audio is transformed to spectral data. It can be set by the Slice and Multiplier controls, the Tap button, or by an external clock signal. Very short slice times result in real-time spectral data, while longer times can create rhythmic spectral patterns. • The Center Freq and Bandwidth controls (and associated CV inputs and attenuverters) control the range of frequencies to be analyzed. The Bandwidth control allows the selection of narrow to wide pass bands on the left side of the pot and narrow to wide notches on the right side of the pot. The ability to sweep the frequency and modify the bandwidth under CV control opens up a wide range of sonic effects. • The Freeze button lets you freeze the spectral integrator, sustaining the currently analyzed spectrum. • The Voice parameter lets you select from 1 to 33 oscillators to resynthesize the spectrum. • The Blur parameter (and associated CV input) is a spectral lag processor that controls how quickly the spectrum can change. • The Feedback control (and associated CV input) lets you route the resynthesized audio back into the entire processing chain for subtle or dramatic feedback effects. At its max, the output becomes self-sustaining, even if the input is removed. • The Waveform parameter selects the oscillators' waveform. In addition to the usual sine, triangle, sawtooth and pulse waveforms, two special crossfading sine and sawtooth waveforms are included. • The Freq control lets you tune the oscillators over a +/-7 semitone range. The frequency is further controlled by the 1V/Oct input and the FM input and attenuverter. • The Octave control, not surprisingly, shifts the pitch of the output by octaves. • The Glide parameter sets the amount of polyphonic glide (i.e., each oscillator has its own glide circuit). • The Mix control (and associated CV input) sets the balance between the original input audio and the resynthesized audio.